This video shows finding songs on Lacuerda.net and importing to MySongbook. This video shows a Mac, but Windows PC would be very similar. Please be aware and honor copyrights. 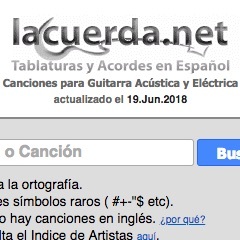 Perform Search at https://lacuerda.net looking for good songs (25s). Edit with http://ukegeeks.com/tools/ to get chords inline with lyrics (1m). Edit in a text editor for specific MySongbook format (2m23s). Save and email to yourself (7m). Open email on iPad/iPhone and import (8m25s).